Aiko and Takayasu Akiba dancing a kachashi dance. On April 30, dressed in the traditional costume of the Ryukyu Dynasty, Takahiro and Aiko Akiba, both of Tokyo, held their marriage ceremony at the World Heritage site Nakijin Castle. The newly-weds exchanged wedding vows in front of family members and tourists in what was the eighth such ceremony to be held at Nakijin Castle. The bride and groom and the rest of the wedding group walked up the stars to the top of the main area of the castle. After 80 year-old Yoshiko Nakaoji, who is the noro or hereditary sacred woman of the castle, prayed for the couple’s future, they and heir fathers signed the marriage certificate. The Amesoko youth group then provided a special performance of eisa, a dance performed during the Obon season in honor of ancestors. In the closing ceremony, the participants danced the kachashi dance and celebrated the future of the new couple. Aiko has been fond of the Nakijin Castle site ever since she came there to shoot a movie. “I feel very emotional about having been able to hold our wedding here. 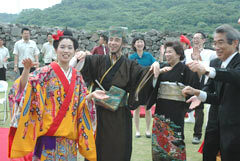 I’m also really happy that everyone enjoyed it being held in traditional Okinawan costume,” she said. “This is the first time for me to be the focus of attention of so many people,” her husband said with a shy smile.